The typology groups express diverse views on how they see life in the country today, the roots of American success and their own place in society. Within both partisan coalitions, groups differ in their assessments of life today compared with 50 years ago. And there is no clear partisan pattern in views of life for the next generation of Americans, with many groups expressing at least some degree of skepticism. However, there are strong partisan patterns in some views of the nation: Republican-oriented groups point to reliance on principles as the main source of American success, while Democratic groups cite the country’s ability to change. And when it comes to the country’s standing in the world, most Democratic groups say the U.S. is one of the world’s greatest countries, while half or more of Core and Country First Conservatives say it stands above all other nations. While there’s much common ground in how typology groups define components of the American Dream, there are differences between groups over whether or not their family has achieved it – reflecting the different personal circumstances and outlooks of the groups. Among the public overall, assessments are mixed over whether people like them are better or worse off in America today compared with 50 years ago. About as many say life for people like them is better than it was 50 years ago (37%) as say it is worse (41%); 18% say it is about the same. Evaluations of the trajectory of life in the country differ among both the Republican- and Democratic-oriented typology groups. 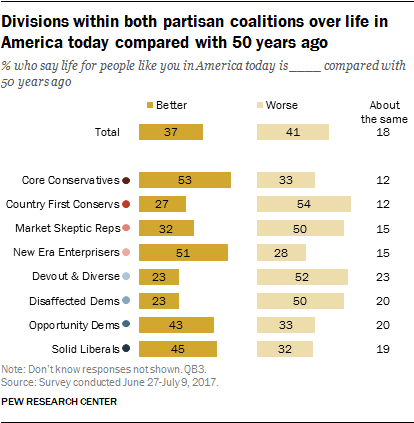 Core Conservatives and New Era Enterprisers are more likely to say life today is better than worse for people like them than it was 50 years ago (53% better vs. 33% worse and 51% vs. 28%, respectively). But other Republican groups take different views. Country First Conservatives – the group most likely to have a negative view of immigrants and openness to other countries – are much more likely to say life today is worse (54%) than better (27%) for people like them. Similarly, 50% of Market Skeptics – who express low levels of personal financial satisfaction – say life today is worse for people like them, compared with 32% who say it is better. On the Democratic side, Solid Liberals and Opportunity Democrats are somewhat more likely to say that life in the country today is better than worse for people like them (45%-32% and 43%-33%, respectively). Disaffected Democrats and the Devout and Diverse, who report low levels of financial satisfaction and think government benefits do not go far enough to help the needy, have more pessimistic views. About half of each group say life is worse today for people like them compared with 50 years ago; about a quarter think life today is better. Looking ahead to life for the next generation of Americans, the public has a generally negative outlook. 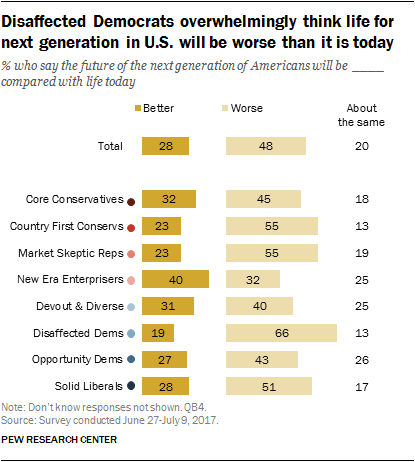 About half (48%) say that life for the next generation of Americans will be worse than life today, while just 28% think it will be better; 20% expect life for the next generation to be about the same as life today. This pessimism is prevalent across most typology groups, but Disaffected Democrats stand out for their particularly bleak views. Two-thirds (66%) think life for the next generation of Americans will be worse than life today, compared with just 19% who think it will be better. This negative outlook is one characteristic that sets Disaffected Democrats apart from other Democratic-oriented groups in the political typology. At the other end of the spectrum, New Era Enterprisers are relatively optimistic about life in the future. Four-in-ten think life for the next generation will be better than life today, while 32% think it will be worse. A relatively bright overall outlook is part of what defines this typology group. There is a widely held sense among Americans that things have not been going their way on the political issues they care about. Overall, 62% say they feel their side has been losing more often than winning on the issues that matter most to them; just 26% see themselves as winning more often than losing. Wide majorities of the groups in the Democratic coalition feel they are losing on key political issues. Fully 86% of Solid Liberals and 83% of Disaffected Democrats say they are losing more often than winning, as do slightly smaller majorities of Opportunity Democrats (67%) and the Devout and Diverse (66%). Views among Republican-oriented groups are somewhat more positive; still, a sense of winning on issues is not widely held. New Era Enterprisers are one of the more optimistic groups: 48% feel they’ve been winning more often on issues, compared with 38% who feel they’ve been losing more often. Views are evenly divided, or worse, among other Republican groups. 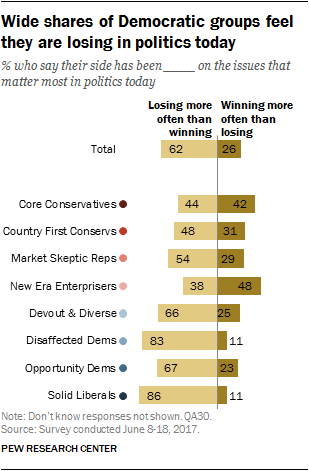 About as many Core Conservatives feel they’ve been losing (44%) as winning (42%) on issues. More Market Skeptic Republicans and Country First Conservatives feel they’ve been losing than winning on important political issues (54%-29% and 48%-31%, respectively). Overall, Americans say that the country has been successful more because of its ability to change (52%) than because of its reliance on long-standing principles (43%). 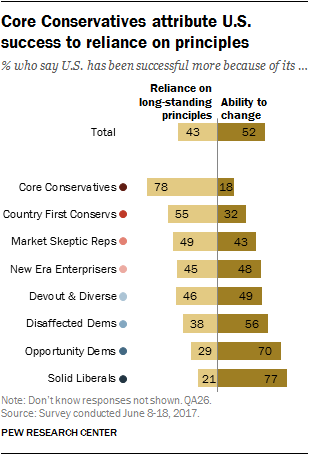 Core Conservatives overwhelmingly attribute the nation’s success to its reliance on long-standing principles (78%). By a narrower margin, more Country First Conservatives also point to reliance on principles (55%) rather than the ability to change (32%) as the bigger reason the country has been successful. By contrast, clear majorities of Solid Liberals (77%) and Opportunity Democrats (70%) identify change as the bigger factor underlying the country’s success. A narrower majority of Disaffected Democrats (56%) also hold this view. There are three groups – including one that leans Democratic and two that lean Republican – that are split on this question. Market Skeptic Republicans, New Era Enterprisers and Devout and Diverse are all about as likely to say they country has been successful because of its reliance on principles as its ability to change. There are differences across the typology groups in opinions about U.S. standing in the world. And there is a particularly wide gap in views between Core and Country First Conservatives and the three most Democratic groups. About three-in-ten Americans (29%) say the U.S. stands above all other countries in the world; 56% say the U.S. is one of the greatest countries, along with some others, while just 14% say there are other countries better than the U.S. Among the two most Republican groups, about half or more say the U.S. stands alone as the greatest country. A 57% majority of Core Conservatives say the U.S. stands above all others, while 40% say it is one of several great countries. Among Country First Conservatives, 52% see the U.S. as exceptional (43% say it is one of the greatest countries, along with some others). 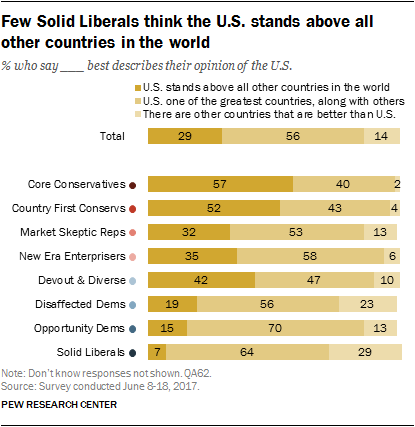 By contrast, just 7% of Solid Liberals, 15% of Opportunity Democrats and 19% of Disaffected Democrats say the U.S. stands above all other countries in the world. Majorities of each of these three groups say the U.S. is one of the greatest countries in the world, along with some others. The Devout and Diverse are much more likely to say the U.S. is exceptional than the other Democratic-oriented groups: 42% say the U.S. stands above all other countries, compared with 47% who say it is among the greatest countries. More Market Skeptic Republicans and New Era Enterprisers say the U.S. is one of the greatest countries in the world than say it stands above all others, a view that separates them from Core Conservatives and Country First Conservatives. Typology groups tend to hold similar definitions of the important aspects of the American Dream, but there are differences between groups when it comes to whether their families have achieved it. Overall, the public thinks freedom of choice in how to live one’s life (77%) and a good family life (70%) are essential components of the American Dream. A somewhat smaller majority (60%) also says that the ability to retire comfortably is essential to how they think about the American Dream. About half or fewer say making valuable contributions to their community (48%), owning a home (43%) or having a successful career (43%) are essential. And just 11% think becoming wealthy is essential to their understanding of the American Dream. There are relatively modest differences between typology groups in these assessments. There are bigger differences between typology groups in views of whether they have achieved – or are on their way to achieving – the American Dream. 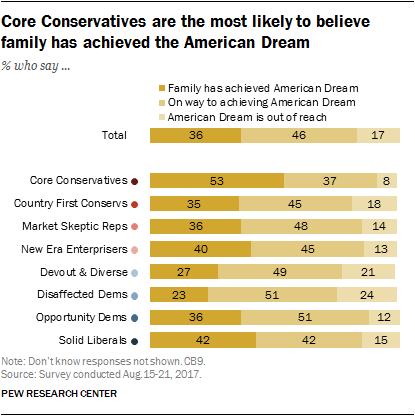 Overall, 53% of Core Conservatives say their family has achieved the American Dream; another 37% say they are on their way to achieving it, and just 8% think it is out of reach. No more than about four-in-ten in any other group say their family has achieved the American Dream. Disaffected Democrats are among the least likely to feel their family has achieved the American Dream: Just 23% say this. About as many say the American Dream is out of reach for their family (24%). Still, 51% say they think their family is on the way to achieving the American Dream. Views are similar among Devout and Diverse: Only 27% say their family has achieved the American Dream, while 49% think their family is on their way to achieving the American Dream and 21% say it is out of reach for their family. Among all other typology groups, the shares who say their family has achieved the American Dream range between 35% and 42%. And between 80% and 90% say either that their family has achieved, or is on their way to achieving, the American Dream.